I am delighted to announce that my book entitled “Perspectives of the Avatar: Sketching the Existential Aesthetics of Digital Games” (University of Lower Silesia Press, Wrocław 2017) is now available. The book was funded by the research grant awarded by the Polish National Science Centre, and you can download it for free from here. The main ambition of “Perspectives of the Avatar” is to sketch the existential aesthetics that explore the situatedness of the individual towards a single player digital game with avatar. 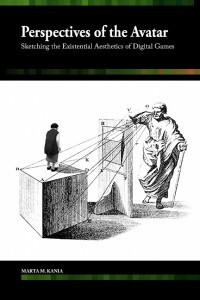 The book focuses on games falling within the category of independent or art games, and builds upon an assumption drawn from existentialism; where the individual facing the world is the central philosophical concern. In this theoretical horizon, a situation can become meaningful only from the point of view of the particular being. This entry was posted in Publications by Marta Matylda Kania. Bookmark the permalink.